When I was younger I wanted to go running about as much as I wanted to eat broccoli. However, as we get older we take on new activities and exercises to stay in shape, or get in shape, or try desperately to change our current shape. Six years ago in an effort to keep my "shape" from getting any bigger, I decided to start running a few times a week. Like a three-year-old forcing down his broccoli, I would lace up my shoes, plan out my 3-5 mile route and get it over with. The number of miles I ran each week fluctuated; the number of times I ran each week fluctuated, but one thing stayed the same. My daughter Gracelyn would always ask, "Dad, can I go with you?" I was glad she asked, but three-year-olds aren't looking for company when forcing down their broccoli, they just want to get it over with. I felt the same way about my running. I just wanted to get it over with. "When you get older you can come with me." I would say. Guess who's gotten older. A lot older. She is no longer a cute little pig-tailed 5-year-old girl. Gracelyn is a beautiful, dynamic 11-year-old middle schooler. I have gotten older too, and running, or as I sometimes like to say "scooting" has grown on me as a way to stay active and stay in shape. Guess who still asks, "Dad, can I go with you?" 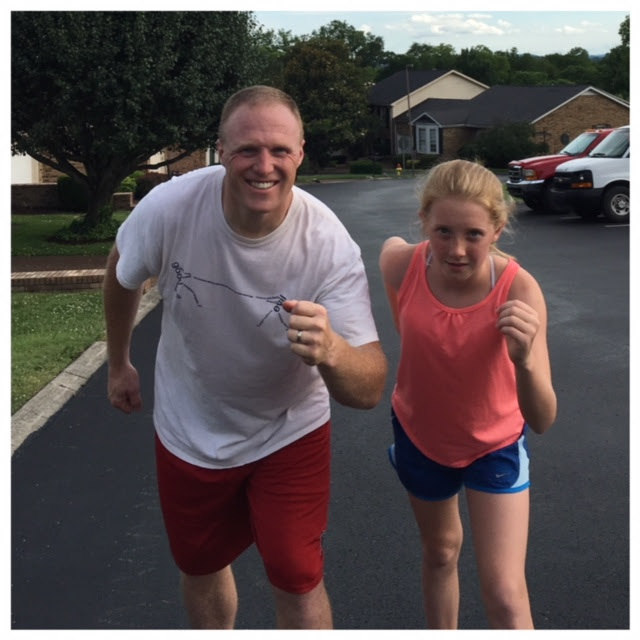 Gracelyn has started lacing up her own running shoes and hitting the road with dad. In fact, the very first run we went on together was a doable 2 mile run through town. I led the way because I had been on this route many times before. I looked over my shoulder often just to see if she was "keeping up." As we turned the final corner and headed to our finish line I realized I didn't have to look over my shoulder anymore. A middle school ponytail went bobbing right by me and she beat her old man to the finish line. I was so proud that she beat me to the finish line, and I am so glad she was with me. So much of what kids want is to simply be with us. We don't have to turn every moment into a Sunday School lesson, we just have to do what we are going to do anyway, and invite them to be WITH us when we are doing it. I do the same thing with the high school football players I disciple, and the college guys I spend time with. Costco runs? Come with me. Work trips? Come with me. Getting new tires? Come with me. That was the heart of what Jesus did with the Twelve, and it doesn't have to be complicated, we can keep it simple. 1) We check in with each other before we start and as we stretch. 2) We always push to the finish line. 3) We pray for each other when we finish every run. It has become a truly sacred time for us. We are closer to each other, we are practicing being healthy together, and every time I hear her pray my heart lights up. You can do it too! Don't overthink it, don't overcomplicate it, just ask yourself what you already do on a regular basis that you can invite your middle and high school and college friends to do with you. Be filled with hope my friend, for you are deeply loved. Jeramy Williams is a story-teller, speaker, and spiritual director. He has worked with thousands of adolescents and college students over the last 20 years, with 13 of those years being on full time Young Life Staff. He loves helping clear the obstacles in people’s lives so they can experience healing, hope, and wholeness in Jesus.